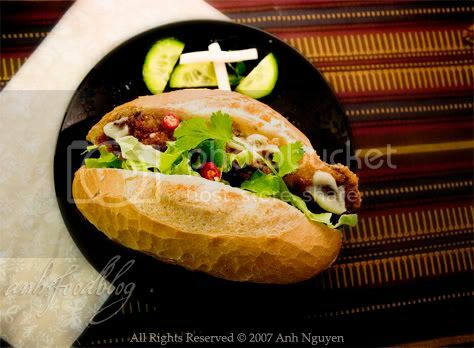 After pho, banh mi is perhaps the second most popular Vietnamese food in the western world. Banh mi simply refers to short Vietnamese baguette which is normally packed with BBQ meat, Vietnamese pâté, herbs and pickled vegetables. Fresh, tasty and amazingly cheap, it is a popular lunch (and even breakfast) for a lot of people. Surprisingly enough, banh mi wasn’t my thing until recently.As a kid, my parents actually banned me from touching it simply because the Vietnamese pâté was normally made from inferior meat (Think hot dog and you will get the idea). 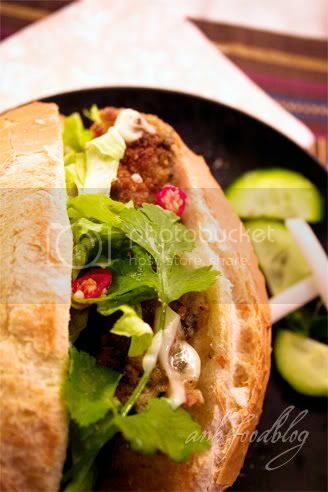 To make it worse, the Hanoi version is kinda boring – you normally just have ghee, pate, some slices of cucumber as filling. I would rather eat the baguette plain than chewing on those things! 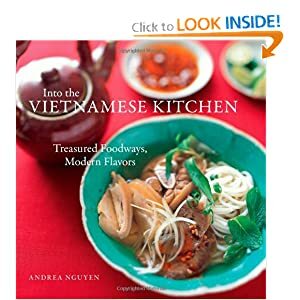 But a trip to southern Vietnam changed my view. The southern version is what you normally get in the west today, full flavors and aroma. No, I still won’t touch the pâté, but everything else is delicious and complete. With such delicious memories for banh mi, when I see the recipe for Oyster Po Boy in a recent food magazine, I can’t help but create my own version. The fresh oysters are rolled in dry breadcrumbs, pan fried lightly and served as a filling in the popular Vietnamese-style baguette. Wasabi mayonnaise is added for some spicy and creamy kick. And of course, it can’t be complete without some shredded lettuce, herbs and pickle veggies. When you can go for different types of pickle veggies, the most frequently used is perhaps carrot. 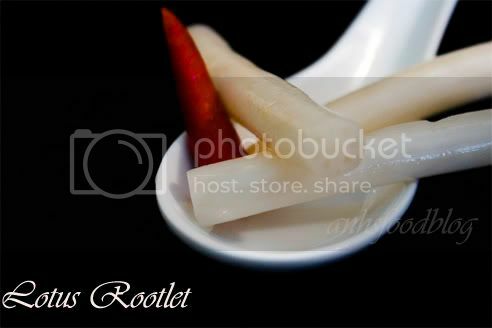 But the authentic banh mi always include a delicious ingredient, pickled lotus rootlet, something I would go crazy for. rootlet has a special crunchy texture. When pickled with rice vinegar, sugar, chili and/or garlic, it also has lovely fresh sweet-tangy flavours. Pickled lotus rootlet makes great addition to salad, especially when paired with prawns. You can almost always find a jar of pickled lotus rootlet at Asian shops. With all the ingredients above, I manage to whip up a wonderful lunch. It’s quick, healthy and delicious. I can’t ask for more. For the wasabi mayonnaise, mix together wasabi and mayonnaise. Set aside. Dip the oyster in flour, shake off the excess, then into egg and finally breadcrumb. Lightly fried in heated oil until golden. Quickly heat the baguettes in the oven if desired. Halve the baguettes and spread with a layer of wasabi mayonnaise. Lightly season with salt & pepper. Arrange the shredded lettuce and pickle veggies. Top with fried oysters, some Asian herbs, chili and extra mayo if desired. Serve immediately. (*) I chose mayonnaise with less vinegar taste. If you can get Japanese mayonnaise, it will be great, too. I would like to submit this entry to Weekend Herb Blogging. Founded by Kalyn, the host of this week is Anna from Anna Cool Find. Please check Anna site out next Monday for the roundup and Kalyn’s blog for more information about WHB.